What do I do if I can’t buy a home without selling mine first? Where can you eat lunch with Sea Turtles in downtown Dunedin? By way of disclosure, let me say that I am not a food blogger (which may be painfully obvious in just a few minutes) nor am I a restaurant critic – see same parentheses. Why then, you ask, are you blogging about restaurants on a real estate blog? I will tell you. It’s pretty simple. I have found, by survey, that an overwhelming number of home owners, not to mention renters, EAT! Yes that’s right, in fact, pretty much all of them do. And quite a high percentage of them like to go OUT to eat. Are you starting to see the connection? I thought you might. This first foray into the realm of writing about restaurants was actually inspired by a brand new restaurant in Dunedin, which I’ll tell you about in a moment. My friend Beth, who drove by the place for weeks before it was official, saw its transformation over that period and suggested we try it for our “girl’s lunch out.” Little did we know it had just opened 3 days before. Not only were we completely charmed by the outside of the place, which didn’t disappoint on the inside, but we thoroughly enjoyed the food and its artistic presentation. We had purple mashed potatoes, for heaven’s sake – I mean purple! And what’s more, they were delicious. Beth declared that it was food with Integrity, which I never thought of to describe food – mostly because I’ve never seen a celery stalk or a carrot stand for anything, but it made sense to me on a different level so I’m going with it. I will say that the taste, freshness and character of all the ingredients, hadn’t been compromised by the preparation. They had just joined in a wonderful taste explosion. Thinking about it, I realized what a nice introduction to Communities, the restaurants , shops and people that make a community a cohesive and memorable place, would be. In the future I may write about many different things under this Communities tab but it will always be with an eye to what gives a place its personality and makes it unique – I may even throw in a few neighborhoods – since this is a real estate blog, but this post just happens to be about a restaurant. So, what’s the restaurant, you ask? It’s called The HONU, which translated from Hawaiian means turtle – to be precise, green sea turtle. Its owner Kimberly Platt, has worked in the food service industry for a good part of her life – in fact she owns and still runs Charlie Tulum’s Dos Tacos Food Truck – named after the sea turtle of the same name from Tulum Mexico who resides at Indian Rocks Beach. Kimberly and her partner fell in love with the sea turtles and with Hawaii and have brought back their love of the animals and Hawaii’s culinary culture to downtown Dunedin, just across from city hall on Grant drive. 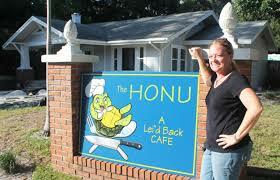 Check out the website for HONU at thehonurestaurant.com or just give them a ring at 727-333-7777 (how did they get that number?) You won’t be disappointed (that is unless you go there for dinner – they are only open from 10:00 to 3:00 right now) Then, for dessert, you might want to consider buying a house….